And while a graphene battery may seem far-fetched, scientists have made a lot of progress over the past year to bring it closer to reality. How to Become a Graphene "Wildcatter"
It's not often that you get a chance to get in on the "ground floor" of an entire new business. But that's just what you have here. In the past, you've heard me say that we are living in the "Golden Age of Materials Science." You see, without Miracle Materials - and the science that backs them - we simply wouldn't have some of the unique high-tech products we take for granted: smartphones, electric cars, and new drug therapies just to name a few. I was one of the first analysts to pronounce this as the "Golden Age of Materials Science." You know what I'm talking about - all those "Miracle Materials" that are changing our lives: There are the advanced composites that lighten our airliners; the great plastics that increase the "cool factor" of today's cars - while also making them safer and more economical. They include one of earth's more abundant resources, and the new discoveries, such as graphene, that promise to revolutionize biotechnology, computers, and industry. Imagine an "alternate reality" where it is possible to balance a Mack Bulldog tractor trailer on the sharpened tip of your No. 2 yellow pencil. And imagine, also, that the tip of that same pencil is worth a small fortune. This "reality" that I'm sketching out for you isn't something that I grabbed from the plot of one of those cheesy Sci-Fi Channel late-night movies. In fact, this reality actually isn't one that I'd refer to as "alternate." It's a reality - a certainty, in fact - that I've been studying, talking, and writing about for a long time. Gold and oil are great. But today you've got a rare investing opportunity to be a high-tech "wildcatter." This new miracle material is destined to revolutionize medicine and biotechnology... electronics... energy... AND computers. The profit potential is staggering. Three ways to play it. 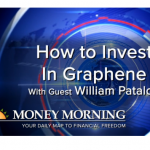 Want to know why everyone is asking how to invest in graphene? For starters: It's one of the strongest materials ever known. It's also as light as a feather. And completely flexible. Plus, it's not just going to change the latest inventions in the defense industry; it'll be used in everyday life. For example, imagine charging your mobile phone or tablet in just 30 seconds. Or pulling up your electric car to a charging station and having a full charge in under a minute. 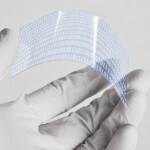 Here's how graphene makes this future a possibility. This incredible material is stronger than steel and lighter than a feather. It's going to have a pervasive impact on the U.S. economy - and the entire human race - by the end of this decade. Here are three ways to invest now. Discovered in 2004, this radical new material made from a single carbon atom has turned the world on its ear. Since then, experts around the globe have heralded graphene as the hot new commodity that could change everything from satellites to semiconductors. As it turns out, graphene is only a part of a much bigger story about a new generation of smart materials. In fact, I've discovered five new materials besides graphene that will change the world, making early investors a fortune along the way. But don't think for a minute that I've backed away from my belief in graphene since I wrote about this "Miracle Material" last December in this article. Since then, my confidence in graphene's impact has only grown. Its uses seem almost endless. With graphene we'll have flat-screen TVs as thin as Saran Wrap, nanotech devices that put the power of a mainframe computer in the palm of your hand and brain implants that combat Alzheimer's. It's the perfect substance for what I call the Era of Radical Change. We have entered a period like none other in history. What was once science fiction is becoming science fact. See, scientists around the world are in their labs right now working on new materials that could affect everything from drugs to smart phones to space travel. And they're making huge strides. As a result, science is set to hand us a whole new group of smart materials that will have a wide impact on the future of the whole planet. Of all the promising new materials out there, this one comes closest to matching graphene's uses in electronics. 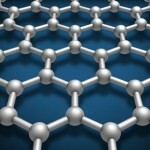 Like graphene, this new substance works in 2D, meaning it has height and width but virtually no depth. It's a lubricant officially known as molybdenum disulfide. But I just called it "magic moly."